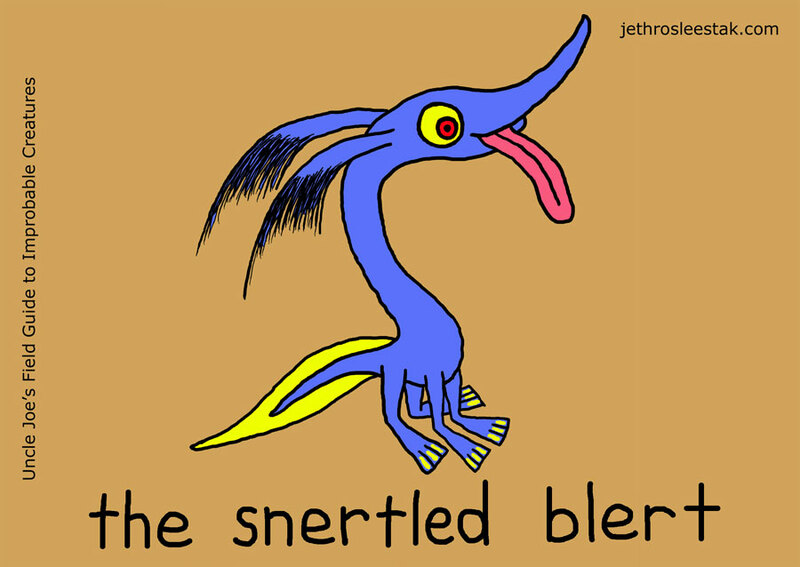 The Snertled Blert is a strange creature indeed. Although seemingly related to amphibians in terms of having moist skin and gills, the Blert gives birth to live young which gestate in wombs similar to those of placental mammals, and yes, the Blert has a belly button like a mammal. But that’s not what makes them weird as hell. What makes them strange is their annoying habit of “blerting” swimmers in the nose, which is when the animal darts up with the speed of a hummingbird and shoots its nine-inch tongue up into the swimmer’s sinuses and then darts away before the victim can react, often making a sound similar to the cartoon Road Runner’s “meep meep” before disappearing. Scientists are divided in opinion as to why the Blerts shoot their tongues up swimmers’ noses. Some argue that they do it for the salt found in mucous; others say they do it for the gross-out factor. Anyway, getting blerted feels just like when water from a chlorinated swimming-pool splashes up your nose and burns your sinuses. As a test of manhood, nine-year-old boys in pagan Scandinavia would immerse themselves in ponds stocked with hundreds of Snertled Blerts gathered for the occasion. In this initiation ritual, the boys would sit in the water and be blerted constantly from sunrise to sunset. The boys were allowed to catch the offending Blerts only by their snerts (long curved snouts), which was near impossible, and so it was better to suffer in silence than to spend the whole time swatting at aquatic booger bandits. Any swimming pool where you’re hoping the chlorine doesn’t bother your eyes this time.